A few months ago as I was at the market getting a deli sandwich when a display caught my eye, it was a stack of tea flavored hard candy. 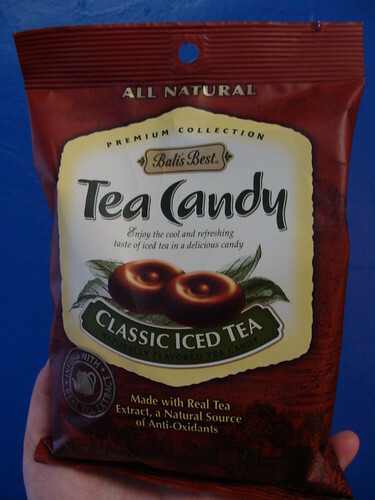 My first thought was “Does it REALLY taste like tea?” my second was “how many anti-oxidants can hard candy really have left in it?” Of course I had to get a bag just to find out. The bag does say after all that it is made with real tea extract. Bali’s makes several different flavors like Green Tea Latte and coffee flavors as well. The candies are all individually wrapped so you can toss a few in your purse; which I appreciate because then I can enjoy some “Iced tea” when stuck in the middle of traffic on my way home from work. Now, I figured that they would just be kind of sweet with a little tea flavor, but WOW, they really are like a cup of sweet ice tea! Just to make sure I wasn’t imagining this I have since forced pretty much everyone that comes to visit me to try one and everyone has had the same surprised reaction. Libby liked them so much she recently asked me to get her a bag since her local market doesn’t carry them. Since I was already getting some I thought I would get a bag for some lucky reader, now you too can force feed these yummy treats to your tea drinking friends and family. All you have to do is leave us a comment about your favorite way to drink tea and on the 8th we will pick a random winner.